If there is one thing that my husband cannot live without,it’s probably prawns. Hehe, yeah prawns!! He loves it that much. But prawns are not very friendly with me though, it gives me allergy. Even then i make prawn dishes very often for him. 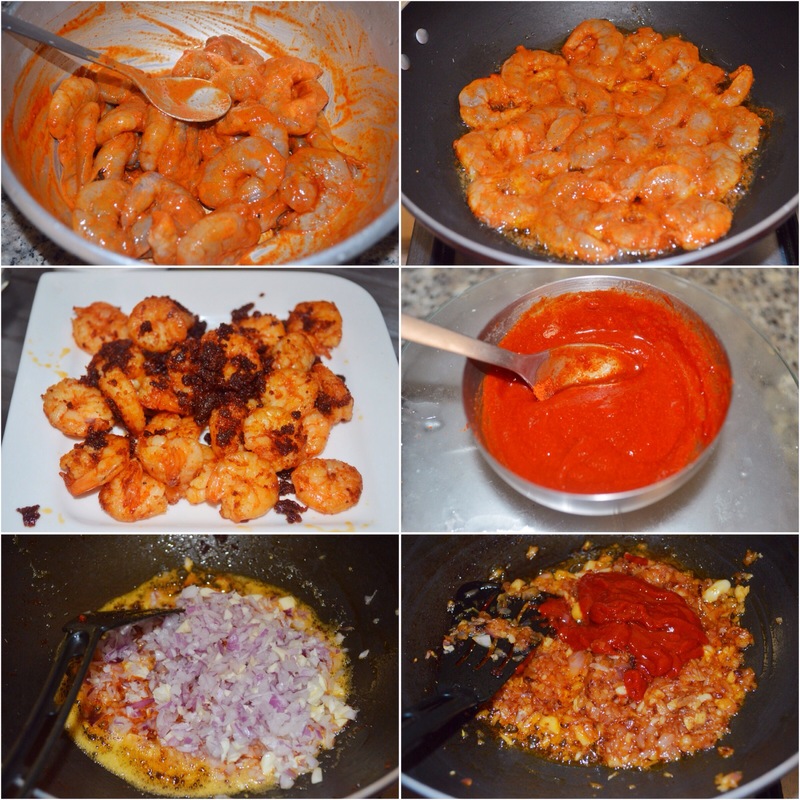 I mostly prepare prawns in the South Indian method, particularly kerala way because thats how Fadal likes it. But i was super bored with the same way of cooking. So i thought of making an Indo-Chinese version of it. 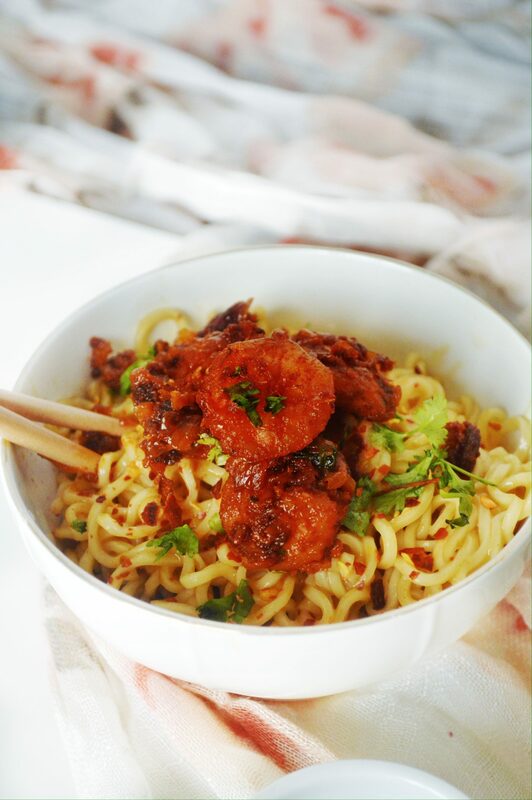 So i came up with this hot and sweet chilly prawns. It was very quick and easy to make and it turned out great. 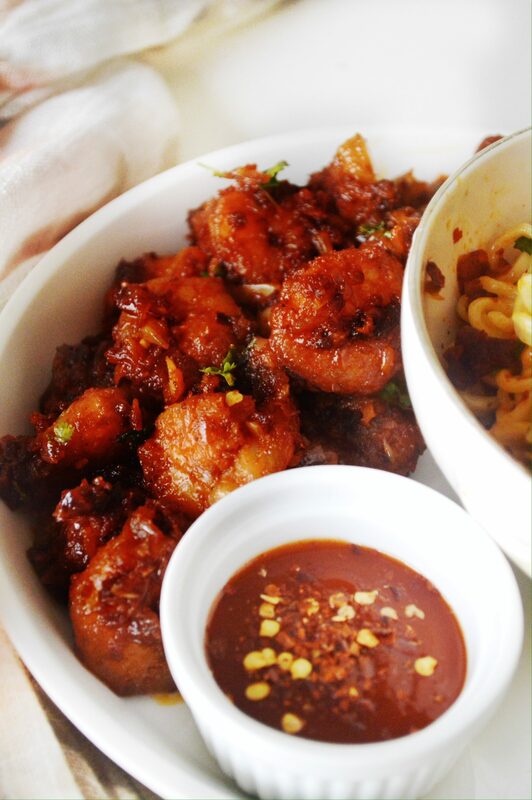 The sweet, hot and sour taste was so tasty that it went very well with the succulent prawns. And this dish was a winner with Fadal too, but i knew it would be. 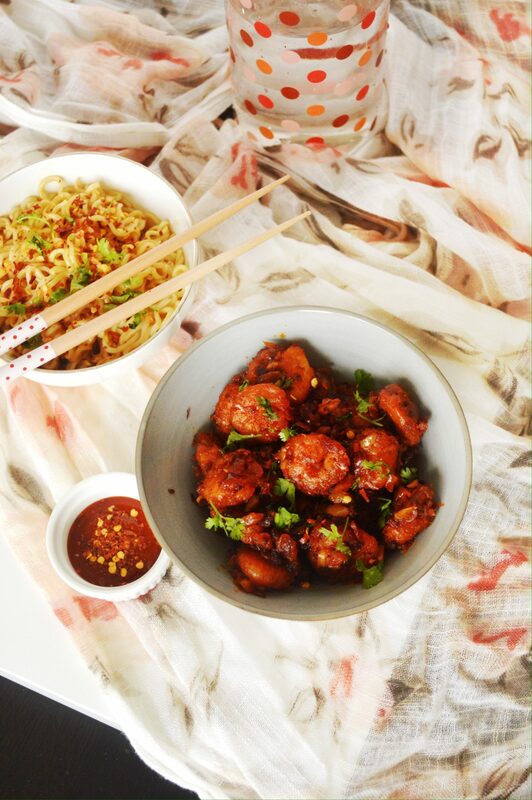 Anything, be it chicken,beef or prawns with hot and sweet sauce is hard to mess up…so much goodness in that combo. 1. Clean and devein the prawns. 2. Marinate it with the ingredients listed under marination and shallow fry it till cooked. Keep aside. 3. Meanwhile mix in the ingredients for the sauce in a small bowl and keep ready. 4. In the same oil in which you fried the prawns, add in the onions, ginger and garlic. Sauté for 5-8 minutes on medium flame. 5. Add in the sauce mix and sauté well for 10 minutes on medium flame. Add 3 tbsp water and cook for 5 minutes. 6. Add in the salt. 7. Throw in the fried prawns and mix well. 8. Garnish with spring onion greens or coriander leaves. 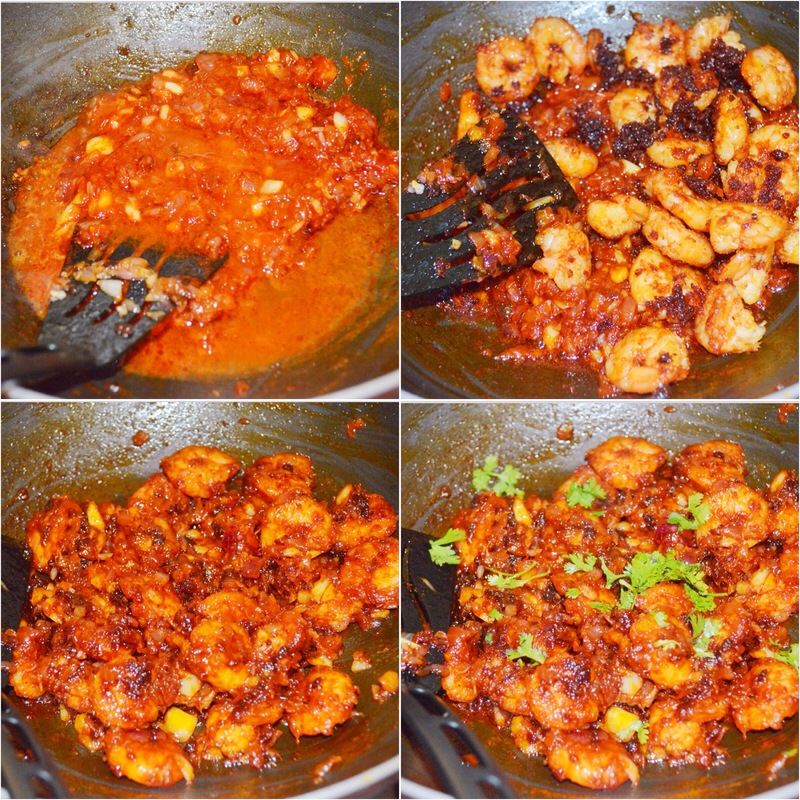 ✔️After frying the prawns you will have the leftover fried masala stuck onto the pan. Don’t discard it, instead add that to the sauce along with fried prawns. That will give a new level of taste to the dish. ✔️ Be careful while adding salt to the marination as well as the sauce, as we are adding soya sauce in both. 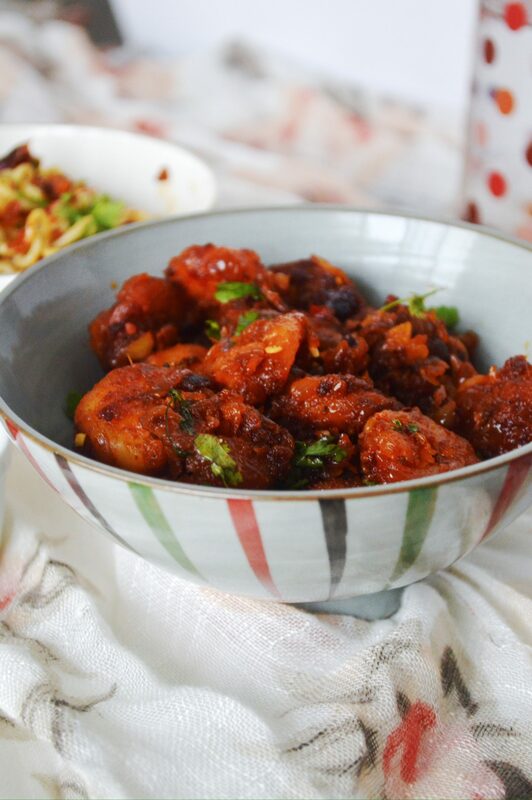 ✔️ Serve this with noodles, pasta, fried rice or rotis. 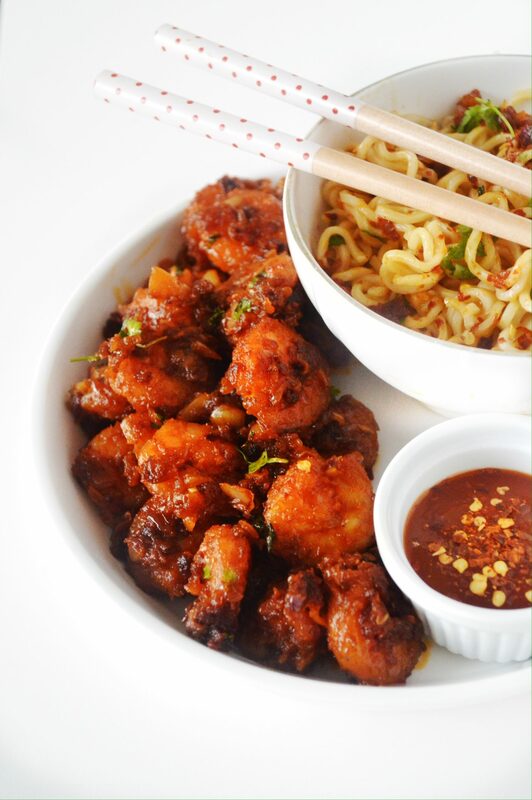 Marinate it with the ingredients listed under marination and shallow fry it till cooked. Keep aside. Meanwhile mix in the ingredients for the sauce in a small bowl and keep ready. In the same oil in which you fried the prawns, add in the onions, ginger and garlic. Sauté for 5-8 minutes on medium flame. Add in the sauce mix and sauté well for 10 minutes on medium flame. Add 3 tbsp water and cook for 5 minutes. Throw in the fried prawns and mix well. Garnish with spring onion greens or coriander leaves. 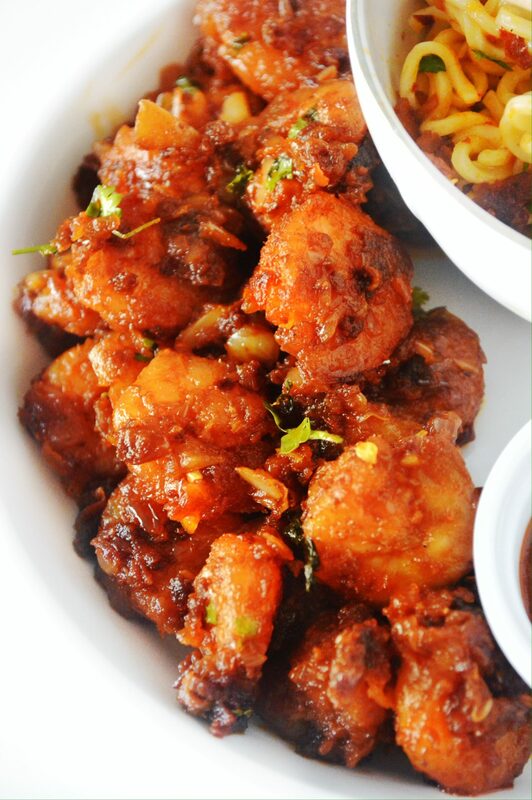 After frying the prawns you will have the leftover fried masala stuck onto the pan. Don’t discard it, instead add that to the sauce along with fried prawns. That will give a new level of taste to the dish. Be careful while adding salt to the marination as well as the sauce, as we are adding soya sauce in both. 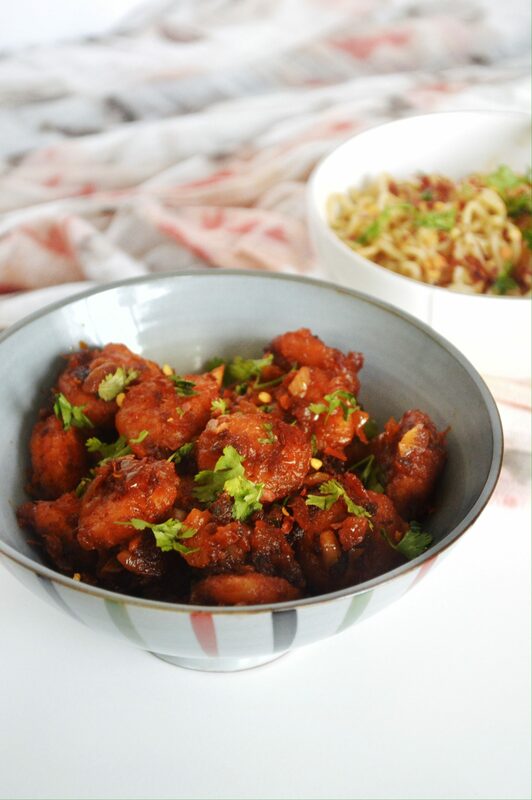 Serve this with noodles, pasta, fried rice or rotis. Gosh, this looks incredible, Sadia! I’m not even a big lover of prawns, but I think this dish might convert me. All of those spices…Yum! 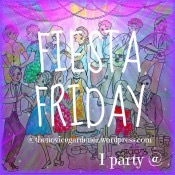 Thanks for bringing it to the Fiesta! Gorgeous hot and sweet chilly prawns Sadia. Your pictures as always are amazing! Thanks a lot jhuls! The noodles are just the usual ramen noodles. Hehe! 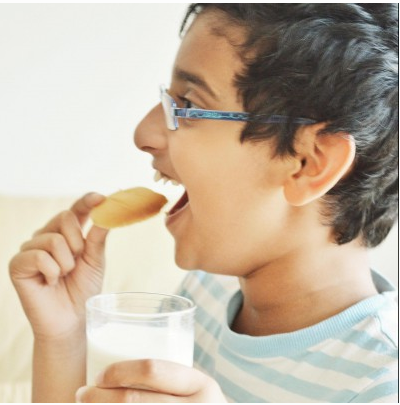 This looks delicious Sadia! 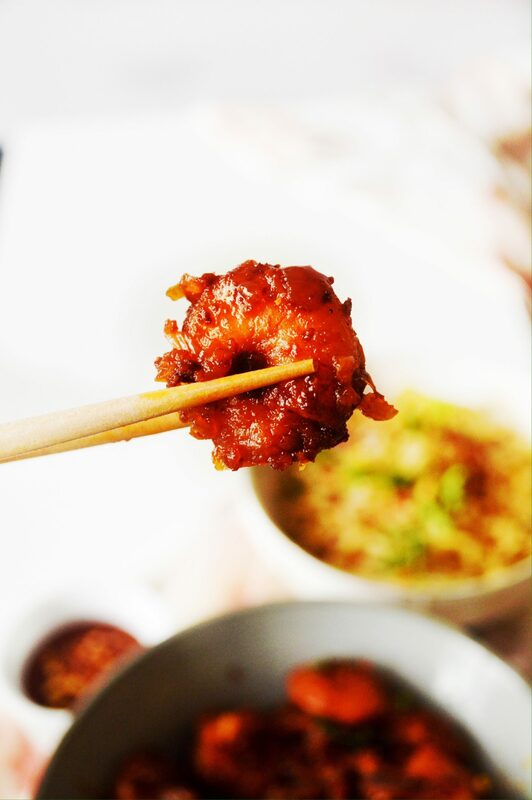 I love prawn and sweet chili is so good too. Together sounds wonderful! What a lovely recipe, the coating on the prawns looks very tasty! And I have that same bowl 🙂 Looks absolutely yummy, thanks for sharing with FF#65! 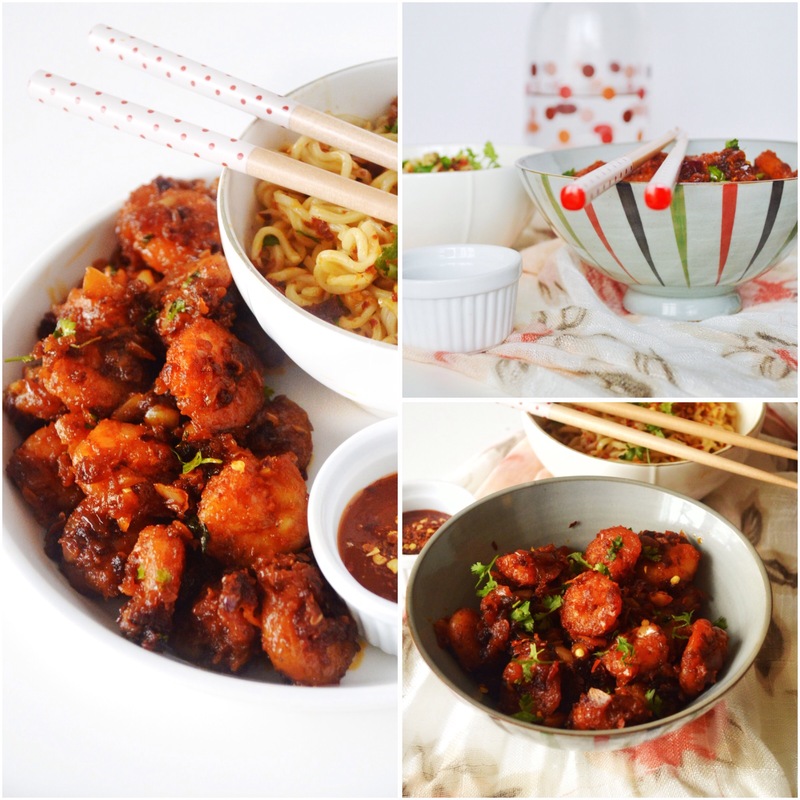 Oh winner combo – I have frozen prawns, my better half loves hot sweet and sour and keeps trying to get me to go to bad restaurants here, because Switzerland really has no good chinese restaurants i have come across, so I will make him this instead – wonderful! I suspect I will be his totally favourite wife for a while..:)! Great Recipe!..Had a wholesome meal,schezwan fried rice and Hot and Sweet Chili prawns..Thanks Sadia! 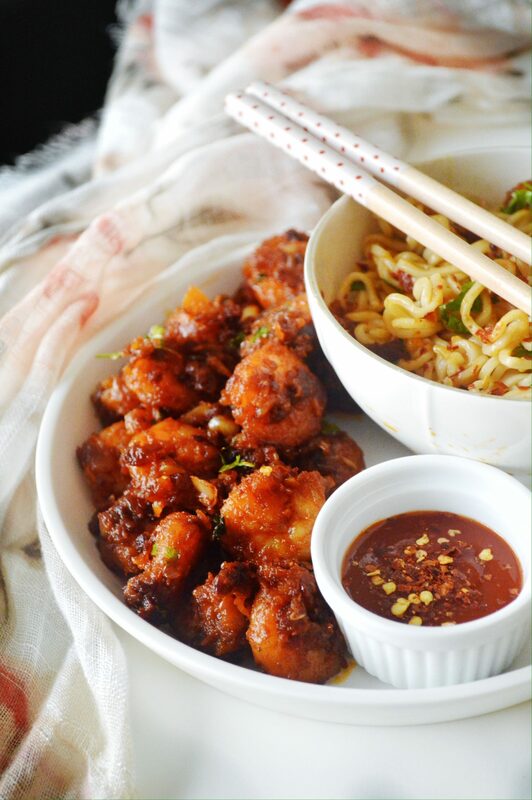 I’m gonna use this recipe for making hot and sweet chilli cauliflower….hope it comes out good…..
Ooh that’s nice. Hope it will be good. Let me know.